Any equipment that confines, restrains or limits your baby's movement is a hindrance to development. 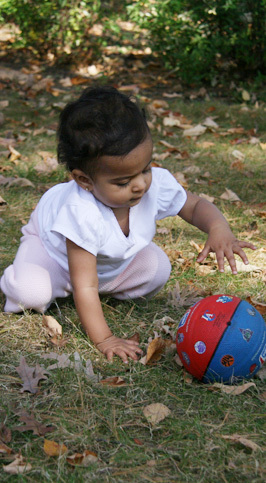 They enable a baby to sit, stand, walk or jump without achieving these steps through his own efforts. Playpens limit movement to 5 feet in any direction and when filled with toys allow even less space. Walkers allow babies to walk before they are ready to do so and discourage them from practicing the movements they really need to practise in order to learn to crawl and then walk. Baby entertainment centres, which don't move, but confine a child in an upright position surrounded by fixed plastic toys stop your child practicing the movement he needs to make by keeping him immobile. Baby bouncers create an experience of jumping before the child has developed the gross motor skills to jump. Babies may enjoy this experience but it is important to remember that every minute spent in a baby bouncer is a minute not moving naturally. Think about ways of reducing the amount of time your child is strapped into a car seat.